If you want to establish a career as a musician, then you need to put in the time and effort it takes to play like a professional. It’s ok to make mistakes during the writing and recording process, but when it comes to playing live, you need to make sure your musicianship and stage presence is on point every time. Whether you’ve been playing your chosen instrument for years, or you’re just getting started, no one is perfect and everyone can improve. So if you’re hoping to take that next step towards playing like a pro, or looking for new ways to hone your skills, here are our tips to help you become a better musician. When a professional musician practices their instrument, they go through scales (or rudiments) repeatedly, working hard to improve their technique. Set yourself a dedicated practice or warm-up regime for each day to burn those scales into your memory. Not only should you practice scales and exercises to maintain your abilities, but you should also challenge yourself to master something new as often as possible. Set yourself realistic targets at every opportunity and work towards them, whether that’s learning a certain scale by heart during one practice, or mastering a full song by the end of the week. By accomplishing set goals, you’ll enjoy a greater sense of achievement as your skills begin to develop, and approach each practice session with a more productive attitude. Perhaps the most important quality in a musician looking to perfect their instrument is patience, especially if you’re just starting out. No one becomes a virtuoso overnight, so if you hit a wall, don’t worry, just keep going until you get it right. It takes a lot of time and effort to be a truly great musician. Don’t take your frustrations out on your instrument! Keep calm and carry on practising! While it’s important to work on your scales and other (more boring) techniques – don’t forget to keep your practice sessions fun! Learn your favourite songs and work on new material around your more regimented exercises to make sure you feel fresh and enthusiastic about your instrument. The worst thing for a musician is when playing becomes a chore, rather than an enjoyable experience. Whether you’re aiming to set up a new band, or just enjoy a friendly jam with friends, playing in a group can help to not only improve your technique but also your timing and improvisational skills. Playing with other people can expose you to new ideas and methods, and is a great way to receive honest feedback on your playing style. Following on from the last point, if you’re planning on jamming with other musicians, it’s important to be able to identify which key you’re playing in at any given time, and adapt your approach accordingly – unless you’re the drummer of course! Learning scales can help you to stay in key during a jamming session. As the more experienced musicians among you will know, each musical scale focuses around a specific key. So, the more scales you know, the better you’ll be at staying in key, improvising on a track, and making sure you sound great playing alongside other musicians. Taking lessons is one of the most effective ways to become a better musician, no matter what your skill level. There’s always something new to learn, and a professional mentor can help you develop new techniques and improve old ones. However, paying for lessons isn’t necessarily for everyone and there are plenty of self-taught musicians out there. If you’re strapped for cash, you could always ask musician friend to help develop your musicianship or watch and learn from one of the thousands of YouTube videos out there covering your chosen instrument. 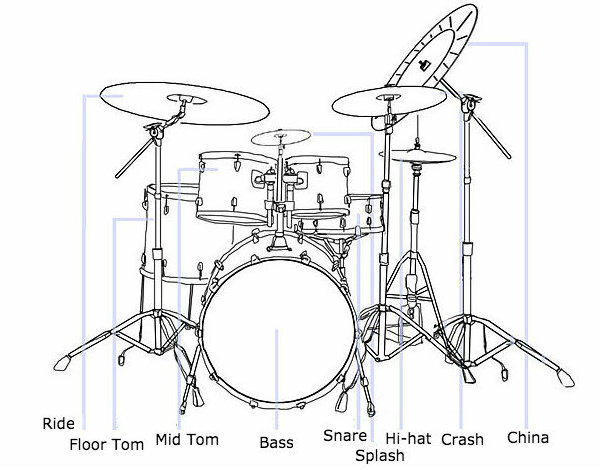 A professional musician should have a thorough understanding of their equipment as well as their technique. You can’t produce a great sound if you don’t know the capabilities and limitations of your gear. However, you don’t want to be an ‘all the gear, no idea’ guy. If you’re new to your instruments, there’s no point splashing thousands of pounds/dollars on a top of the range bit of kit, when you can get the same results from an affordable one. Learn everything you can about your chosen instrument – not just how to play it! They are plenty of free resources out there for musicians looking to improve their skills and learn new songs. Websites like UltimateGuitar.com and 8notes.com offer access to thousands of tablatures, chord charts and sheet music. If you want to learn a new track or cover a certain song, there’s nothing to stop you searching for the chords, tabs and notation online. It’s often tempting to stick with what you know, but as a musician, you should try to leave your comfort zone as often as possible, discover new ways to play and constantly challenge yourself. Yes, it can be frustrating, and yes it’ll be hard work, but the rewards mastering something brand new are worth it. In a year’s time, you’ll look back with pride to see how far you’ve come!